[New for 2013, lost the Duff branding in 2015] Blue Bunny is always a good source of new products every year so let's get their first 2013 review started. People seem to be digging the Duff Goldman tie ins and they've gone over pretty well here at the scoop so much so that seeing a new version always puts a smile on my face. This year's addition is Caramel Fudge Brownie Sundae. No it's technically not a cake, but do you really care? Yeah, me either. 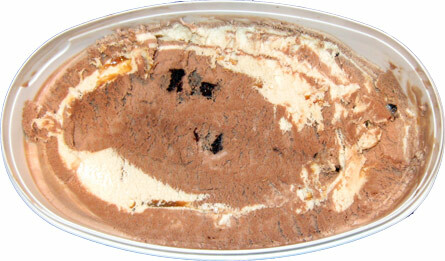 This one is Chocolate Ice Cream Swirled with Caramel flavored low fat ice cream embedded with rich dark fudge brownie pieces and laced with buttery caramel ribbons. Ok, that's much better. 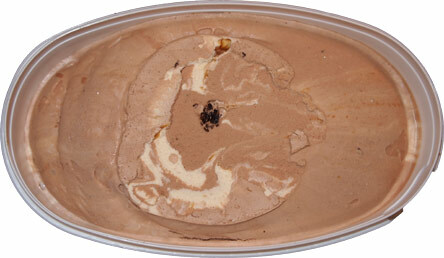 We've got the majority ruled by the chocolate ice cream and a nice funky swirl of the caramel ice cream. Now I'll need to do a second scoop to verify, but it seems as though the buttery caramel is swirled into the caramel low fat ice cream, and then that is swirled into the base chocolate ice cream. We've also got a good amount of brownie bits to stare at. My first impression? It's a delightful mainstream milk chocolate flavor. No complaints there. After a few bites of base, I start digging into the other parts of this container. Now when they say buttery caramel, they mean BUTTERY. It's a gooey caramel that's doesn't seem sticky or artificial just oh so buttery and distinct. Let's just say that there's definitely no fear of overlooking it. Alright, let's take a peak and these very fudgy looking brownie hunks. They hit you with a moist jolt first, but as you dissect them the brownie flavor is actually subdued and instead you are left with a bit of flour flavor instead. I thought maybe it was just me or a bum bit, but surprisingly both my wife and daughter agreed that these could use a little tweaking. Despite that minor hiccup, this flavor has won us over. The buttery caramel is strong and seems to linger with every bite. I think it's because it's not just the swirl that's buttery, but the caramel ice cream seems to have the same flavor as well. Now mix that with the chocolate base and it makes for a nice sweet treat that goes down very easy. On Second Scoop: Ok, I was going to do one more picture to show off all the brownie bits, but just take my word for it.What's really cool is that I just ate a couple of brownies that were bigger than the one you see above. I think the ones on top may have been a little dryer than the ones further down. It's hard to resist to urge to dig them all out first.... ok, need to stop inhaling this ice cream and type a few thoughts. It's nice, it's different, it's bold, the texture is nice, and the brownies are really growing on me. 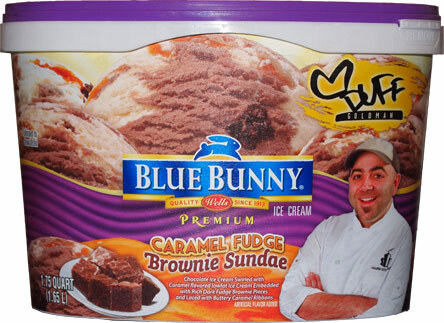 Blue Bunny has a winner here, plain and simple. And to think Blue Bunny was on sale this week and...I...got...Neopolitan? (God how lame can I get?) Can't wait to find this one in stores! I just picked this up tonight as per your recommendation, and man am I happy I did! It's awesome! Something about the caramel ice cream and caramel swirl makes this flavor a winner! I did notice the cake bits to be dry and floury like you said. 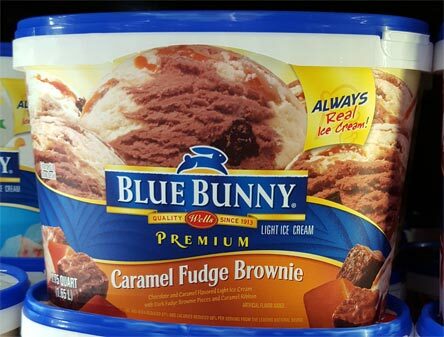 It's seriously the best caramel I've yet to taste in an ice cream!